One of our readers, Berry Choco Latte, commented on my last post and brought to my attention the fact that I totally forgot to talk about my scalp. Whoops! I decided to do a quick post on the subject, but again it quickly turned into a novel. Nevermind. "Nice comprehensive post. I've started trying to form my own regimen. My hair LOVES water and DCs. Only issues I've noticed lately are an itchy scalp and my hair's been shedding more than usual. Any tips?" This had always been a huge problem for me, from my relaxed days to the beginning of my natural days. I did notice, however, that as soon as I stopped using harsh sulphate shampoos, removed potentially follicle-clogging mineral oil from my product arsenal and washed my hair more often, it improved considerably. However, I was still prone to the itchies. I found that Jojoba Oil with a drop of Tea Tree Oil on my scalp was the only thing that relieved this for me. Some people find that Coconut Oil works best for them, others prefer Castor Oil. In the beginning of my healthy hair journey, I tried Extra Virgin Olive Oil. Disaster (for me, anyway)! Itched like crazy. Earlier this year however, I was inspired to do a 4-week food detox, not for any weight-loss purpose, but because I was generally feeling quite sluggish and like I needed a cleanse. This involved, amongst many, MANY other things, cutting sugar out completely, including everything containing it. And when I say everything, I mean EVERYTHING! So as well as eliminating sweets and chocolates (which was a difficult enough task, as although I generally have extremely healthy eating habits, sugar is my weakness and I have been known to do things like eat an entire pack of biscuits in one sitting. And that is just scratching the surface), I could only eat certain types of bread for example, I made my own salad dressing as a lot of the shop-bought ones contain sugar, I really only trusted freshly squeezed juices, etc. I had to be meticulous about reading the labels on everything before putting it in my mouth. It was only after the second week that I noticed my scalp hadn't itched for as long as I could remember, and I hadn't oiled it once since the detox began. Totally unheard of for me. I started looking into foods I had eliminated and their link to itchy scalps, and that was when I came across the issue of candida. The idea of the effect of candida on the body tends to be supported more by practitioners of alternative medicine. Most conventional doctors reject the idea. However, I like to pay close attention to what my body is telling me, and if my scalp doesn't itch when I stop eating sugar, there must be something to it. I have re-introduced sugar to my diet now, but I have significantly decreased the amount I ingest (to be fair, this is not hard considering my previous habit), limiting it to the odd sugary snack. However even with this vast reduction I have started to notice some itchiness has returned, although nowhere near as bad as before. Also funnily enough, the comment reminded me of this post I had recently read on The Natural Haven, which explains that there might be different reasons for itchy scalps, and the follow up shows how things you might be doing in an attempt to help may just be exacerbating the problem. Simply put, not being a scientist, nutritionist or doctor, I unfortunately can't give you one final solution to your question, however I would advise paying attention to products used (nothing too harsh), build-up on your scalp (are you cleaning it often and adequately enough? Are you using products with ingredients that rinse off easily? ), your diet and then if necessary seeking medical advice if symptoms persist. Sometimes solely oiling your scalp could just be a case of treating the symptom, and masking the real cause. First of all, for those who may be unfamiliar, I'll quickly explain the difference between shed and broken hair. 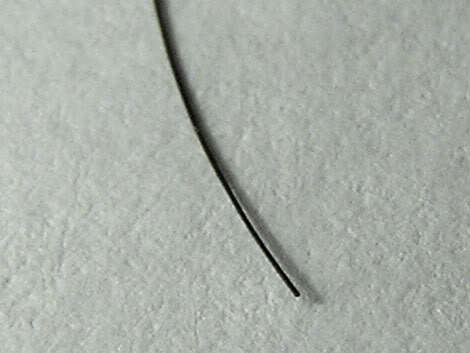 If you examine an errant hair that has managed to escape from your head, does it have a white bulb on the end, like so? If so, it is a shed hair. Everybody sheds. (To be honest, everybody experiences breakage as well. As I've mentioned in earlier posts, you just need to manage the amount of breakage you cause by rough handling and the way you wear your hair). It occurs when hair follicles, which work in cycles, transition from the growth phase to the resting phase, and the average amount shed is apparently around 50-100 a day. I shed a lot of hair! As in, an alarming amount. Sometimes I feel like it is way over the average number. 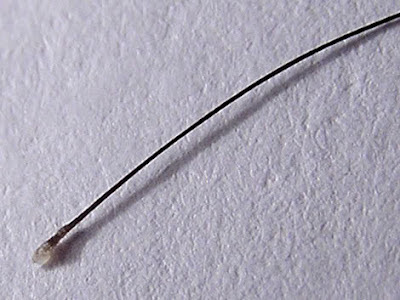 As I type, I have just pulled out 4 shed hairs by running my hands through my hair. I used to be worried by this, especially as I would watch youtube videos and see people losing a fraction of the amount I do in their entire wash routine. Now I content myself with the fact that 1/ the majority of hairs I lose are not broken (and yes, my hair obsession sadly did reach a level where at one point I probably did examine every single one that came off my head. Now I just look at an extrapolated sample as they are coming out. I may be missing some broken ones, but I've quickly realised that life really is too short), 2/ regular check ups confirm that I am (thankfully) in good health, and I have become familiar with the amount of shedding that is normal for me (a hair ball of anywhere around 1/8 to 1/4 of my palm in my wash session, depending on how long it has been since my last wash, and if I combed or merely finger detangled the last time), and 3/ the hair on my head doesn't seem to be thinning for now. In fact, it seems to be doing quite the opposite. So I don't worry when I'm disposing of that ball of hair every week. certain medications and major surgeries and treatments like chemotherapy"
You can read more on what she has to say on the subject here. However again, as with the itchy scalp, I would advise consulting a medical professional if you suddenly realise you are shedding much more than usual, and for a prolonged period of time. Thank you, Berry Choco Latte, for inspiring this post. Thats definitely worth more than 2kobo!!!. Fact: Are you willing to make that sacrifice...., my jury is still out on that. BUT im not as reckless as i used to be with sugar.